In this, the concluding column on the history of the Wayne Methodist Church, we shall present a few highlights from its dedication down to the present day. The lot on which the parsonage stands was a gift to the church from George W. Childs, as was the ground for the church itself. When some of the far-sighted members saw the advantage of owning the lot immediately adjacent to the church on the west for use when they should need it, A.M. Ware was delegated to contact Mr. Childs. Another gift from Mr. Childs was a generous donation to the organ fund. Following his death early in 1894, a copy of the minutes enumerating these three gifts was sent to his widow. The small organ originally used in the church was replaced a few years later by one built at a final cost of $2215.11. In 1936 the very beautiful organ now in use was given in memory of Richard J. Freeman by his wife and sons. By September 1893 the wagon sheds built at the back of the church were completed at a cost of $538.50. All of these expenses and many more kept the board of trustees of the church in a constant state of financial anxiety. But faithful to their trust they must have been, for in the records the same names appear over and over again – many those of men who had been charter members. Ever faithful, too, was the Ladies Aid Society, which apparently worked continuously in order to give help to the church in any financial emergency. On June 30, 1907, the 17th anniversary of the church was celebrated both at the morning and evening services. A most attractive and well illustrated booklet marking the occasion has been preserved in the old Minute Book. Six months later on January 5, 1908, the ceremony of the burning of the mortgage took place. 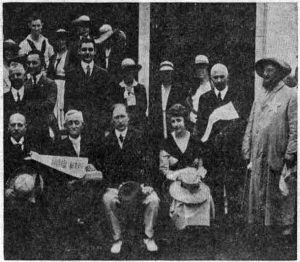 The ceremony was participated in by Mr. Thompson, the pastor, “assisted by President Brown of the Board of Trustees, together with Miss Maude Hayden of the Intermediate Department of the Sunday School… while the flame of the burning papers was dying out, the congregation joined heartily in the singing of the Long Meter Doxology.” And, best of all, the financial report showed that at the close of the conference year in February, 1908, there would be a comfortable balance in the bank. In May, 1909, definite plans were made for building the parsonage “at a sum not to exceed $6000, not including furnishings.” Meanwhile, “the Ladies Committee was of the opinion that the Ladies Aid Society would consider favorably the proposition to raise the money necessary to furnish the parsonage, and to carry any interest that might accrue until the end of the conference year.” Two pictures in the yearbook dated February 28, 1910, show the completely furnished parsonage looking then just as it does today. So much has transpired in the more than 60 years since the dream of early Wayne Methodists became a reality that it has been possible to touch upon only the highlights in this series of articles. In closing them, however, it is interesting to add that the church has recently acquired the Herbert L. Badger property just to the south of it for a Parish House. With constantly increasing Sunday School membership, provision for that branch of church work will be made in these newly acquired quarters. In casting about in her mind for a source of more material for this concluding article on the big Methodist picnic at the A.M. Ware farm, near Flemington, N.J., in the summer of 1919, your columnist suddenly bethought herself of the files of “The Suburban.” And there on the front page of the issue of September 5, 1919, was a two-column spread on the big event. It now comes to light that this affair was a Labor Day celebration. By mere coincidence, your columnist wrote the first article for the present series for the September 4 issue of “The Suburban”, just 34 years, minus one day, from the date on which the original article appeared. The start from Wayne was earlier than remembered by Mrs. Austin Houck, and given in last week’s column as 9.30. According to one original source, it was some two and a half hours earlier on a rainy Labor Day morning. R.C. Ware’s costume, as commented on in previous columns, is explained by the fact that he was “constable” for the day’s outing, and wore on his chest the very large tin star which shows so clearly in the group picture in last week’s column. And so ended the big Labor Day picnic of 1919 on the New Jersey farm of Mr. and Mrs. A.M. Ware. 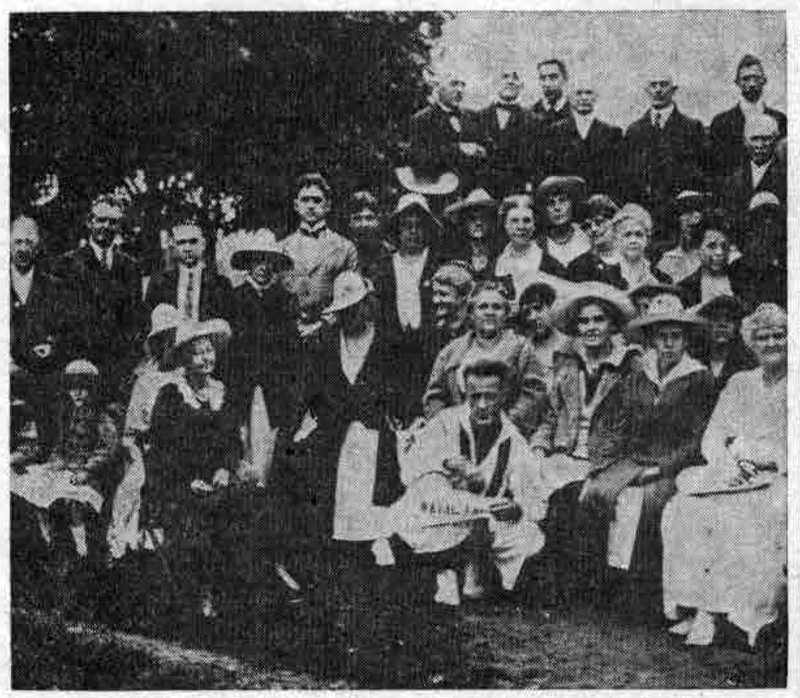 The group picture illustrating this week’s column is another small section of the large picture described in last week’s column, taken in the summer of 1919, when members of the Methodist Bible Classes of Wayne and their friends met at “Broad Acres Farm” in Flemington, N.J., as the guests of Mr. and Mrs. A.M. Ware. 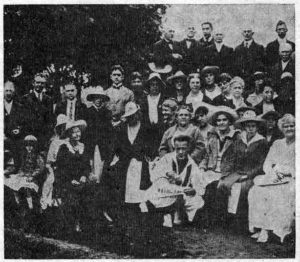 Although these gatherings were yearly summer affairs, this one of 1919 was outstanding in point of view of members and of guests. In order to identify by name others in the large picture in addition to those identified by Albert A. Ware and Mrs. Gertrude Ware Case, your columnist has called on Mr. and Mrs. Charles H. Wetzel, of South Wayne avenue, and Mr. and Mrs. Austin J.H. Houck, of Pembroke avenue. Both couples were among the guests at the Ware farm. Mrs. Houck, speaking for her husband, who is out of town at present, clearly recollects that Mr. Houck was responsible, not only for his own transportation, but for that of a number of others, since he drove one of the large Wayne Iron Works trucks. In consequence, Mrs. Houck went with Mr. and Mrs. I.V. Hale in their car. Mrs. Wetzel recollects that their daughter, Barbara, who is shown in the large picture on the lap of Mrs. A.M. Ware, took the trip from Wayne to Flemington snugly tucked into a clothes basket. Common as that mode of transportation is for very small fry nowadays, it was a novelty in 1919. Mrs. Houck says that, as she remembers, the cavalcade of automobiles met at the Methodist Church, getting under way about 9.30. A.M. There were several car breakdowns along the way. However, since all took the same route, those who were stranded were picked up by cars still running. Albert Ware has several pictures of these automobiles, as they were parked at the Flemington farm at the end of their run. A portion of the clearest of these pictures is shown in today’s column. To those of us who owned automobiles in the 1919 era, the picture will bring vivid memories of our pride in the possession of a vehicle that is now antiquated. 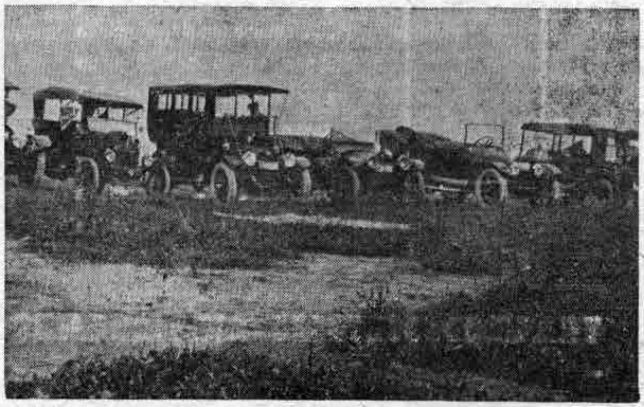 The second car from the left is interesting in that it brings forth the question of whether it was the 1919 version of a present day bus or of a modern station wagon. Mrs. Houck recollects that the day was overcast in the beginning, and on the cool side, which accounts for the coats worn by many of the women. Once the sun shone enough for picture taking, the photographer hastily assembled his group. In order to show everyone present, the camera moved from left to right down the long line. But the motion was so slow that at least two of the men present ran from the extreme left in order to be photographed again at the extreme right. They were Albert Ware and his uncle, Ralston C. Ware. “R.C.” as the latter was known to everyone, is the most prominent figure in today’s picture, in the bizarre costume topped off by a farmer’s large straw hat, under which the heavy false whiskers and nose are very prominent. 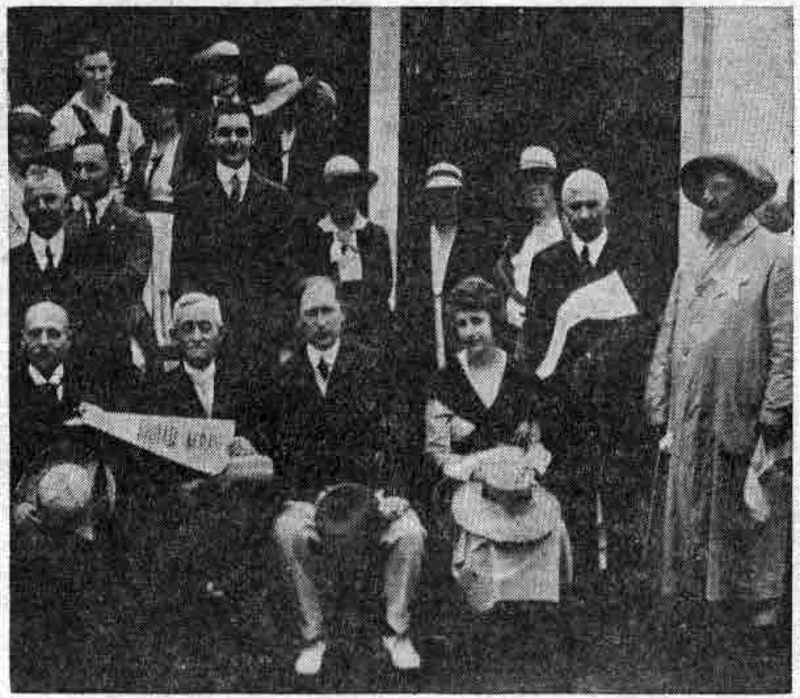 In great contrast to “R.C.” is the gentleman so sedately seated at the extreme left on the front row. He has been identified by several as the Rev. Bickley Burns, then Methodist District Superintendent. A special stop had been made at Ambler to pick up this important guest of the occasion. Names to be added to those given in last week’s column include those of Mr. and Mrs. William Clark, with their sons, Paul, Horace and Leonard, and their daughter, Mabel; Mr. and Mrs. Albert Cresmer, George Constable, Rev. 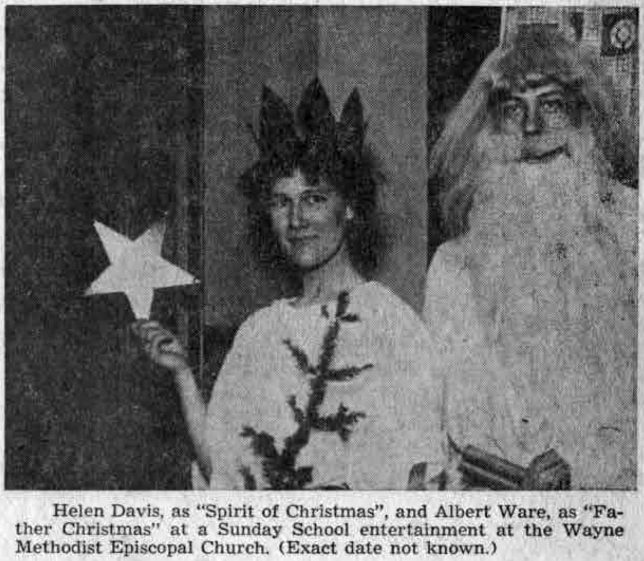 Elliot, from the Central Baptist Church of Wayne; Anthony Falcone, Mr. and Mrs. Flynn, the Misses Ruth and Jean Hoey and Mr. and Mrs. Eli Houck. There was also Mr. and Mrs. Charles Hagy and “Junior” Hagy, Mr. and Mrs. David Hackford, and William Hackford; Mr. and Mrs. I.V. Hale, Edward Hurst, Mr. and Mrs. Hannum and William Harkins. Also, Mr. and Mrs. H.O. Hadley, Miss Emily Suplee Hallowell, Mr. and Mrs. Austin Houck and Mr. and Mrs. Harry Jacob. Still others included Mr. and Mrs. Philip De Marse, Henry Metz, the Rev. Benjamin Mill, Miss Ruth Orme, Benjamin Pugh, Ralph Robson, Mr and Mrs. Charles C. Shoemaker, Mrs. Wesley Sentman, William P. Sassaman, William Silver, Mrs. Charles Smedley, Mr. and Mrs. Charles Swartz and Miss Emily Swartz and Mr. and Mrs. William Weaver. To those of us who, like your columnist, were living in Wayne in 1919, the duplicate pictures lent for use in this column by Albert A. Ware and by Miss Anna Wood, are subjects for an evening’s study and contemplation, for they bring back memories of a time now more than 30 years past, memories, too, of the people who lived here then, many of them already old timers. They are reminiscent also of the style of clothes they wore in 1919 and of the kind of good times they enjoyed. A later issue of the column will show the kind of automobiles our citizens drove in 1919! 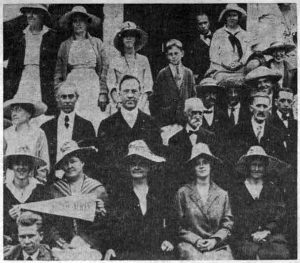 Although the picture used in this week’s column shows more than 30 people, it is a reproduction of but a small part of the original group of several hundreds of persons gathered at “Broad Acres Farm”, the country home in Flemington, N.J., of Mr. and Mrs. A.M. Ware, then of West Wayne avenue, Wayne. 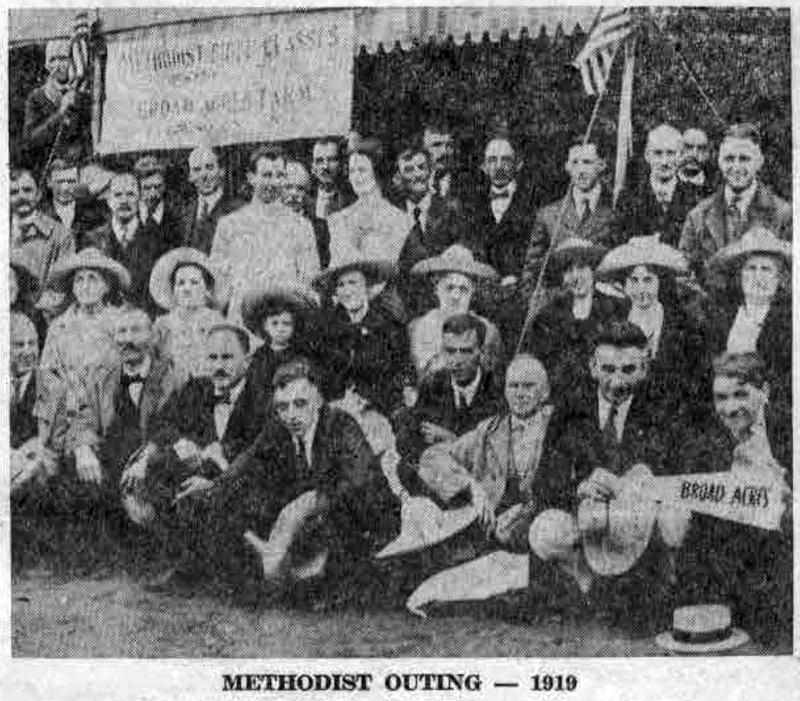 The occasion was the 1919 gathering of the Methodist Bible Classes of Wayne. To attend these yearly outings, it was not necessary, however, to be a member of these Bible classes, nor even of the Wayne Methodist Church. A general invitation was extended by Mr. & Mrs. Ware, particularly, perhaps, to those among their friends who had automobiles, who were asked, “Wouldn’t you like to come, and perhaps bring others?” For, 30 odd years ago, transportation by car was not the commonplace matter it is in the summer of 1953. 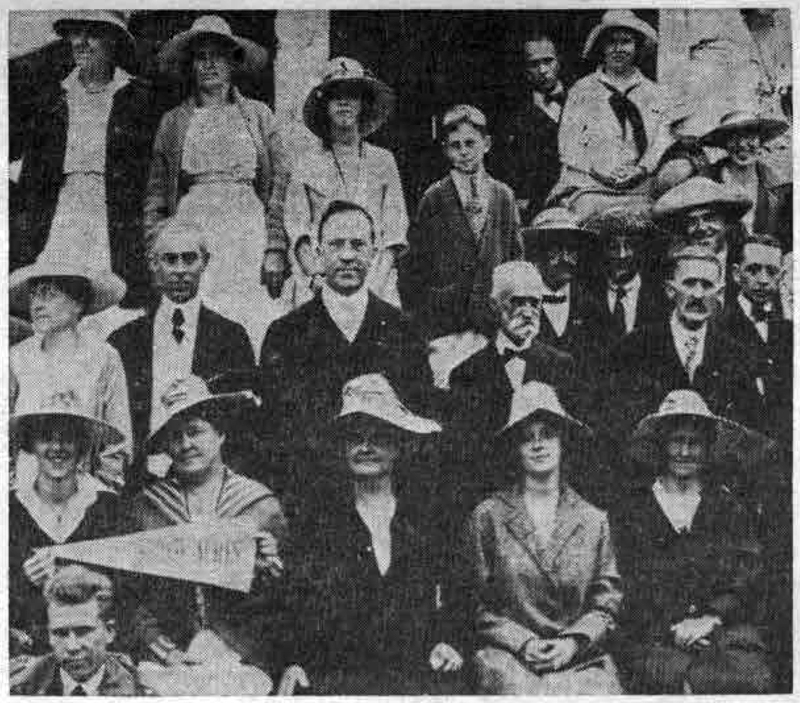 The small pennant held by the man in the lower right hand corner is one of those that were tied on to cars that brought the Wares’ guests from Wayne to Flemington. One side read, “Broad Acres”, the other, “Wayne”, thus making each one in the group recognizable to the others. The trip to Flemington was a more time consuming one in 1919 than it was in 1953. The start was always early, the occasion a merry one. The attire of the guests was much more formal than it would be on a similar occasion nowadays, especially among the men. Most of the latter wore dark suits with white shirts and heavily starched collars, one of them sporting a wing-tipped Ascot tie and stick pin. Some few had on soft collars, but not a man among them was minus his coat, and many wore vests, carefully buttoned from top to bottom. How different from a similar picnic group of today! However, the women were much more casual and comfortable in appearance than the men, most of them dressed in the 1919 version of the present shirtwaist dress, though somewhat longer in the skirt now than then! Mr. Ware made some attempt to lighten the spirits and attire of his men guests once they had arrived. All were furnished with broad brimmed farmers’ straw hats, but even when they wore them – and many merely held them in their hands – they did not do much to counteract the stiff collars and dark ties. One notable exception in the picture is R.C. Ware, brother of the host. “R.C.”, as he was familiarly known, must have been some kind of “grand marshal” for the occasion. In a picture to be shown later in this column, readers will see him in a big farmer’s hat, a full length linen duster ornamented with a huge metal star and with whiskers and a false nose! In the next few issues of this column reproductions of other sections of the large picnic portrait will be shown. Among those identified by Mrs. Gertrude Ware Case, Albert Ware and your columnist in examining the entire picture have been: Mrs. William Lacock, J.D. Lengel, George Lentz, Mr. and Mrs. Robert H. Luckenbill, Miss Vivian Lee, the Reverend and Mrs. Henry Rushton and Henry Rushton, Jr., Mr. and Mrs. C. Wesley Reep, Harry Rodenbaugh, Major and Mrs. William Aull, Mr. and Mrs. William Bateman, William Bryan, Miss Lilian Barley, Mr. and Mrs. Harry Beale. Also, there are Mr. and Mrs. A.S. Case and their son, Richard; Mrs. A.A.H. deCanizares, Phil Collins, Mr. and Mrs. Milton J. Porter, Mr. and Mrs. Carl Wetzel and daughter, Barbara; Reverend Henry E. Walhey, Mr. and Mrs. A.I. Wood, with their son, Nelson, and their daughter, Anna; S.C. Wetzel, Oscar Weideman, Jr., Steward A. Young, William T. Field and Mrs. Frank Freeman. Still others will be named in succeeding articles in this series, to which Mrs. Patterson will be glad to add any picnic reminiscences given her by her readers. Telephone: Wayne 4569.